Sixty-five soldiers and their family members attended a troop appreciation dinner for the Fort Riley Warrior Transition Unit (WTU). 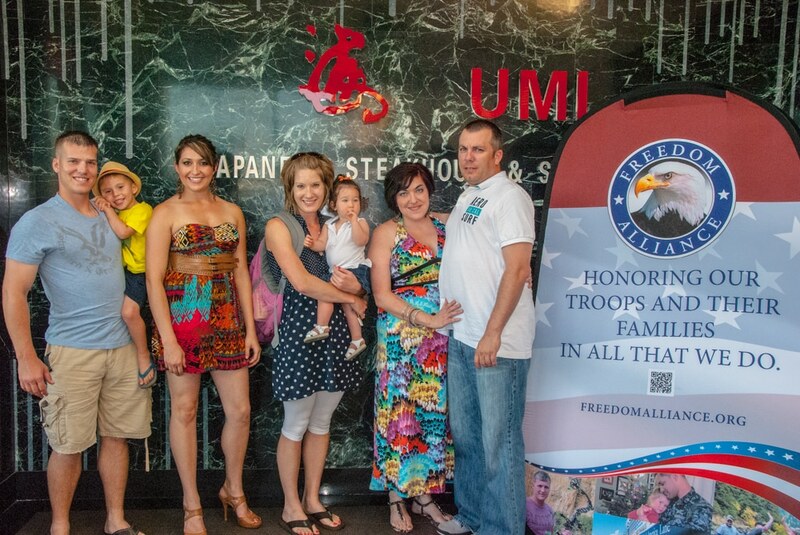 The event was held at the Umi Japanese Steakhouse in Manhattan, Kansas, and the hibachi-style meal provided a fun and casual setting for our heroes and their families. The WTU at Fort Riley helps wounded service members either transition back into the military or achieve civilian jobs after their recovery. A lot of these service members suffer from post-traumatic stress disorder (PTSD), in addition to their physical wounds, after experiencing trauma during combat. Upon arrival at Umi, each guest was photographed and presented a specialized Freedom Alliance frame for their photo. “Truly therapeutic,” David, a soldier recovering in the WTU, said to sum up the evening. He poked another soldier and joked, “Jake didn’t freak out from all the people. So, it’s a good night.” PTSD often creates anxiety and stress in crowded situations, but Freedom Alliance works hard to make sure that doesn’t happen. Soldier Brandy teamed up with the chef to entertain the dinner guests; the hibachi master would toss grilled shrimp through the air and Brandy would catch it in her mouth. She and her friends Jared and Joe are from Iowa and have been at the WTU for almost a year. Their families are far away, and we think they in particular enjoyed the night out, being that they stayed later than the others. Truly, around the dining room we saw soldiers and family members laughing and chatting and children having fun. Therapeutic would be the perfect word to describe it.